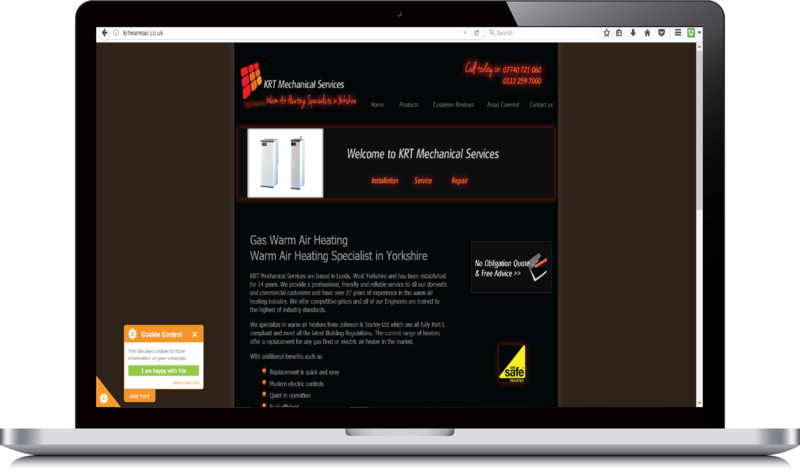 KRT Mechanical Services are based in Leeds, West Yorkshire and have over 27 years of experience in the warm air heating industry in both the Domestic and Commercial sectors. They specialize in warm air heaters from Johnson & Starley Ltd. The company install, service and repair a range of warm air heating systems including; Economaire, Hi - Spec, ET, Mod Air Flow and Brink and Water Heater Circulators and cover many regions in the North including Yorkshire, Lincolnshire and Lancashire amongst other areas. KRT Mechanical Services requirements were for a brand new website which clearly and effectively displayed the company's products and services and the benefits of Warm Air Heating systems. The project also involved us designing them a company logo and providing them with our services for hosting and domain name registration.